They are going to Calais in the name of art. They will stay there for one week with illegal emigrants. Then they will cross the English Channel in a self constructed raft. 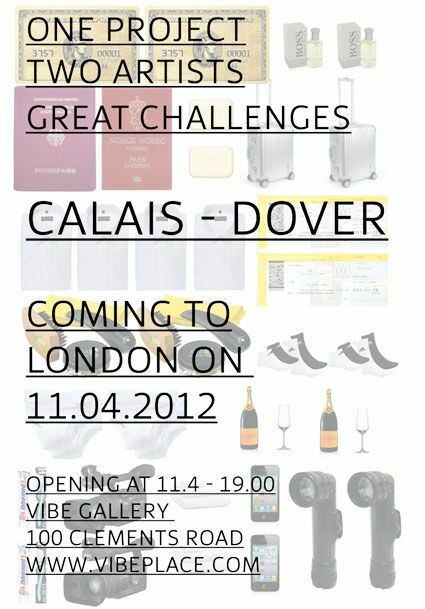 In England they will go straight to London to the Vibe Gallery to present the project. You are invited. Julian à 'ffler (1985) lives and works in Bremen, Germany and is mainly working with performance, video installation or all three of them in combination. In his works he often deals with social and political themes in a provocative manner that forces the viewer to reflection and often also reaction. Julian has been studying Fine Arts in Ottersberg, Germany and at the University of Fine Arts in Bremen. www.julianoeffler.de Paida (1984) is Norwegian but lives and works in Berlin working with photography, film and performance or a combination of the techniques. He often focuses on political and social themes seen from a spiritual point of view. Paida has a studied photography in Stockholm, Sweden and Fine arts at the University of Fine Arts Bremen, University of Fine Arts Berlin and the University of Fine Arts in Venice. http://www.paida.org/ The project is supported by H.A. Bockmeyers Travel-grant.